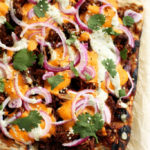 This grilled vegan BBQ jackfruit pizza with hemp seed cheddar was designed with summer in mind. Grilled pizza is topped with BBQ pulled jackfruit, tangy hemp seed cheddar cheese, zesty hemp seed ranch, red onions, and fresh cilantro. In a colander, drain and rinse the jackfruit. Cut the core of the jackfruit (the triangular tip) from the flesh and discard, leaving only the stringy portion of the jackfruit. In a medium bowl, whisk together the coconut sugar, chili powder, garlic powder, cumin, and cayenne pepper. Add in the jackfruit flesh and toss to coat. Heat a large skillet over medium and add the seasoned jackfruit. Sauté for 3 to 5 minutes to bloom the spices. In a small bowl, whisk together the barbecue sauce and water and pour it over the jackfruit. Reduce heat to low, cover, and simmer for 15 minutes or until tender, stirring occasionally. Remove the lid from the skillet and use 2 forks to shred the jackfruit. Continue to simmer with the lid off for another 5 minutes or until the barbecue sauce is reduced, stirring occasionally. Meanwhile, make the hemp seed ranch by combining all ingredients in a high-speed blender and blending on high until smooth. Spoon into an airtight jar and refrigerate until assembling. Meanwhile, make the hemp cheese sauce by combining all ingredients in a high-speed blender and blending on high until smooth. Pour into a medium sauce pan and heat over medium. Whisk continuously for 5 minutes or until thickened. As it cooks, you may notice greenish flecks from the blended hemp seeds -- this is normal and to be expected with hemp seeds. Heat grill over high, ensuring that the grill grates are free of buildup and debris. Meanwhile, lightly flour a clean work surface and roll out your pizza dough to desired shape and size. Don't stress about creating a perfect circle or rectangle, this is a rustic pizza so a freely-formed shape is welcome. Transfer the pizza dough to a pizza peel or maneuverable cutting board and brush the top with approximately 1 tablespoon of olive oil. Once the grill is hot, reduce the heat to medium and carefully oil the grates with olive oil. Carefully flip the dough onto the grill, oiled side down, close the grill lid, and cook for 2 to 4 minutes or until the bottom is golden-brown. Then, brush the top, uncooked portion of the dough with olive oil and carefully flip the pizza. Once flipped, brush the top of the pizza with the 2 tablespoons barbecue sauce and spread the jackfruit over the pizza. Then, use a tablespoon to drizzle or dot the top of the pizza with the hemp seed cheddar. Top with as much of the sliced red onion as desired. Close the grill lid and cook for another 2 to 4 minutes or until the bottom of the pizza has golden-brown grill marks. Carefully transfer the pizza back to the pizza peel or cutting board. Drizzle with the hemp seed ranch and sprinkle with fresh cilantro and Manitoba Harvest Hemp Hearts. Slice and serve immediately. *You can also use a precooked flatbread pizza. Simply reduce the grill time.